Medal of Honor recipient U.S. Marine Corps Sgt. 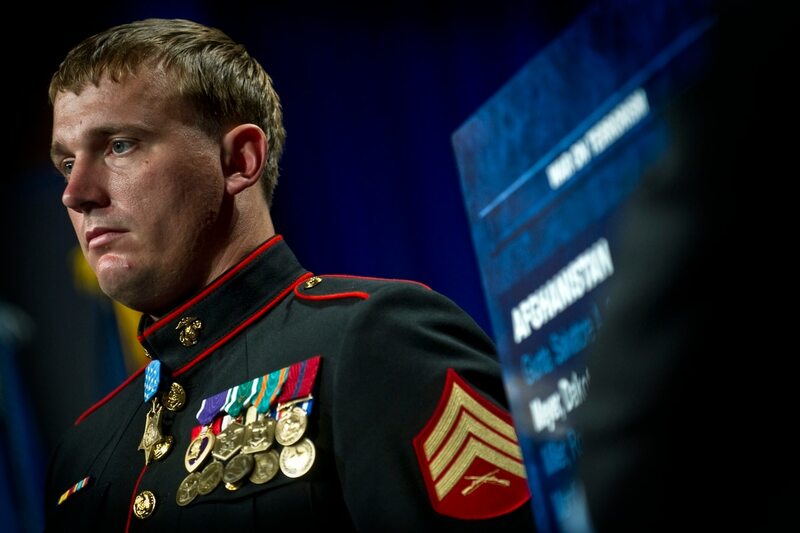 Dakota Meyer stands at attention while his award citation is read during an induction ceremony at the Hall of Heroes in the Pentagon. Meyer was awarded the Medal of Honor for actions in Afghanistan on Sept. 8, 2010. Meyer saved 13 U.S. Marines and soldiers and 23 Afghans. When veterans acquire a significant public profile, experts say they can help bridge the "military-civilian gap." Or they can help widen it. 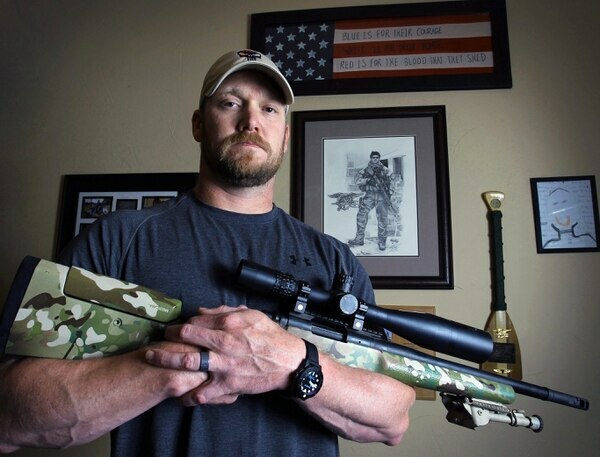 Some veterans who have had broken into the media cycle — some on purpose, some not — include recently engaged Medal of Honor recipient Dakota Meyer, Iraq War vets Noah Galloway and J.R. Martinez, Iraq veterans-turned senators Joni Ernst and Tom Cotton, and Chris Kyle, the Navy SEAL portrayed in "American Sniper," who was killed by a fellow veteran. But experts warn that the way Iraq and Afghanistan veterans often are portrayed in mainstream media, movies and TV shows doesn't necessarily enhance the public's perception of veterans — and often makes veterans feel even more alienated. Military and civic leaders have discussed for years the military-civilian "gap" — the social and cultural disconnect between those who have served and those who have not — in various studies, articles and other venues. But the idea of a single, monolithic gap, if it ever really existed as such, is splintering these days as veterans are portrayed as altruistic heroes or badly damaged goods. "Sometimes the coverage generates these negative tropes, but sometimes it generates these overly positive images that ... gives civilians very polarized views of veterans that isn't necessarily very realistic," said Meredith Kleykamp, an associate professor of sociology at the University of Maryland. Kleykamp has been involved in military studies for 15 years. She and her university associate Crosby Hipes are working on a study that looks at how the media and society in general often tend to view veterans are "victims" — a widely publicized misconception that Kleykamp feels does not represent the average veteran. "I don't see a big celebration of veterans who are just like my husband — the regular guys," she told Military Times. David Gale, founder and CEO of We Are The Mighty media outlet, agrees. "When you really scratch the surface not very deep, you find an infinite amount of stories, and not just stories, but life," Gale said. "If you tell all of these types of stories, you realize that the veteran population is just as diverse as the American population — except they also have a shared experience." Gale, whose newly minted website caters content to current and former service members and their families, said the phenomenon of veterans ending up in the spotlight with a "hero" or "wounded" tag isn't necessarily a bad thing, but he added that he wants to try and move the discussion past that restrictive narrative. Kleykamp noted that narrative generates some division within the veterans community itself. "When they think that's all that civilians think or know about them, that generates how they interact with civilians," she said — and that has the potential to spawn even more stereotypes. "People talk about the civilian-military gap like it's one thing, but there are all kinds of gaps," Kleykamp said, including economic, gender, experience, cultural backgrounds and more. "It's hard to say what solves 'the gap' because it depends what gap you're talking about," she said. But while a permanent, overarching "fix" may never be found, there are ways to change perceptions, she said, starting with perhaps the simplest solution of all: familiarity. "People should get to know someone in the military — befriend your military neighbor," she said. "The best thing that can happen is for people to have natural, human relationships with one another." Some new programs and resources are popping up that could help foster deeper understanding. Retired Brig. Gen. John Michel, former commanding general of the NATO Air Training Command in Kabul, Afghanistan, feels that after well over a decade of continuous combat operations, veterans and the general public want to connect more than ever. Michel and other military leaders founded GeneralLeadership.com, a blog that works to recognize and connect service members and the general population "which we serve." "There is a gap, whether real or perceived," Michel said. "Part of it is real because there are not natural conversations that flow. That's what General Leadership is — we're a dialogue, we're an intentional engagement." The almost 2-year-old blog — which Michel said has around 40,000 to 50,000 unique views monthly and has a national radio show, "The General Leadership Hour" — focuses on leadership, character and civic responsibility, and is expanding on a variety of platforms so people can engage and have "that unfiltered conversation." Aside from the blog, Michel said leaders and former service members can easily connect with the public on social media platforms such as Twitter in an honest, unfiltered way. "You get a sense of what veterans are as a group sometimes through their unfiltered perspectives," Kleykamp said. Another social media experiment takes it a step further: The National Endowment for the Humanities-supported YouStories project asks vets and family or friends of vets to upload their personal stories which are then archived at the Library of Congress. "I think programs that get collaboration between community and veterans is important," said Peter Meineck, a New York University professor who heads the YouStories project. The former British Marine said the project is funded through NEH's Standing Together, an initiative that seeks to promote understanding of the military experience. The main focus of the project is its series of national reading, performance and discussion programs that brings veterans and their families together with the public to read, watch and discuss the ways in which ancient stories about war resonate with the experiences of vets today. "By using these ancient stories and discussing them, what happens is we discuss ... subjects people sometimes are uncomfortable talking about," Meineck said. "What then happens is we ask the vets to contribute their knowledge and their experience, and now we're having a conversation about the 'uncomfortable' themes in our culture — but it never gets political. It only validates the conversation."